Delicious smoked trout spread - make it in 2 minutes! This easy smoked trout recipe is for a yummy spread that you can make in just a minute or two in your food processor and serve as a delicious seafood appetizer. The "secret" ingredients giving this yummy smoked trout pâté a special zip are horseradish, lemon juice, and dill. Cream cheese mellows out all the flavors. We like to make this smoked trout spread when friends drop by because it tastes really good but is so fast and easy to make. 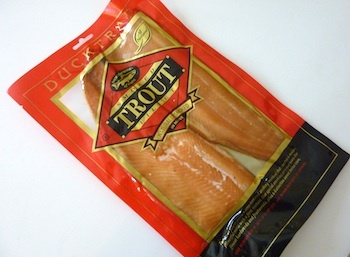 Smoked trout keeps for weeks in the refrigerator, so we usually keep a packet on hand in case of unexpected company. In our area, stores often have pepper-encrusted smoked trout in addition to the plain type shown in the photo. The peppered trout also works well for this recipe, especially since the cream cheese softens the bite of the pepper. Do use fresh, rather than dried, dill for this recipe - it really enhances the taste. If your trout has skin still on one side (some packets of smoked filets do, and some don't), remove the skin - easily done by holding the skin at one end and peeling it off, usually in one piece. Remove any obvious or large bones. Break the trout into several smaller pieces. Put it and all other ingredients into the food processor. For a smooth spread, blend for about 30 seconds until all ingredients are completely combined. For a chunkier spread, pulse several times just to blend the ingredients. Store in a covered container in the refrigerator for 2-3 hours to let the flavors combine. The spread will also become firmer as it chills. We usually serve this smoked trout spread in a small bowl with crackers and a small knife for spreading, but after refrigeration, it will be firm enough so that you can also mound it onto a platter for serving. If you like capers, you can place some next to the trout.